All thumb-nail images in this article may be clicked and viewed full screen. Dr. Frank Conrad, assistant chief engineer of Westinghouse Electric, developed the technology that made KDKA Radio possible. 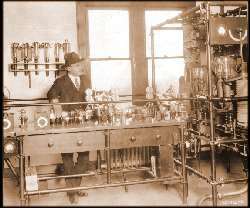 He constructed a transmitter and installed it in a garage near his home in Wilkinsburg in 1916. 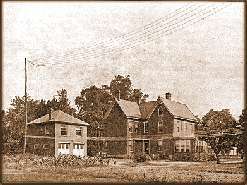 The station was licensed as 8XK. When amateur radio operation resumed after the war, most radio messages consisted of amateur radio operators trading information, describing the equipment they were using and where their stations were located. Bored by the chatter, Dr. Conrad chose to introduce entertainment to the airwaves, and on Oct. 17, 1920, he put his microphone by a phonograph. 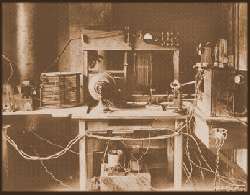 At 6 p.m. on Nov. 2, 1920, 8KX became KDKA Radio and began broadcasting at 100 watts from a make-shift shack atop one of the Westinghouse manufacturing buildings in East Pittsburgh. The Pittsburgh Post provided election returns by telephone, and returns were relayed to almost a thousand listeners, who learned through this fantastic new medium that Warren G. Harding had defeated James M. Cox in the presidential race. You can listen in Real Audio format to part of this first official broadcast from KDKA via their Web Site.